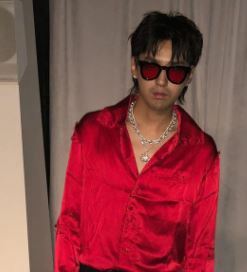 UPDATE: As predicted below, Kris Wu's dominance of the U.S. iTunes singles chart has ended, ostensibly because his music has become available in China. His full-length, Antares, however, returned to #1 on the album side on 11/7. (Some of the nerds cited below say he was waiting until his birthday to drop the music in his home country.) In any event, Ariana Grande's "thank u, next" (Republic) is now #1 on the tracks chart, followed by "Shallow" from A Star Is Born; spurred by Bohemian Rhapsody's box-office bow, Queen's The Platinum Collection (Hollywood) is the top-selling album. There is another arrival from China: Jackson Wang's "Different Game" f/Gucci Mane. The Meng Xiang Qiang Yin Culturual and Broadcast Co. release is #4 at iTunes. Much chatter around the biz has surrounded the iTunes dominance of Chinese pop star Kris Wu, who's had multiple tracks on the singles Top 10 and his full-length, Antares (on Chinese imprint Ace Unit Culture Media, via Interscope) at #1 on the album side. As we know, Ariana Grande's new single, "thank u, next," has been #1 on Spotify and Apple Music since its arrival over the weekend and is only kept from the top spot at iTunes by three Wu tracks. Tech-world nerds believe the Wu phenomenon at iTunes springs from Chinese fans who couldn't yet buy his music in their home territory... and so spoofed the system with Virtual Private Networks (VPNs). Wu's music is due to become available in China imminently; once that happens, these same nerds say, things should normalize on the iTunes chart. The fans' subterfuge has sparked no small amount of grumbling from the Grande camp, especially her fans. How will all this be reflected on the charts? Will the President call it a rigged election and voter fraud from China? Stay tuned.